The Sinai Peninsula is a triangle-shaped peninsula located in Egypt that has an area of about 60,000 square kilometers between the Mediterranean Sea (to the north) and Red Sea (to the south). 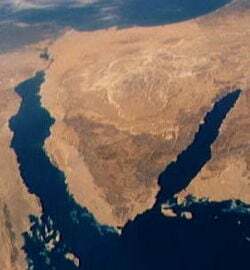 Its land borders are the Suez Canal to the west and the Israeli-Egyptian border to the northeast. The Sinai Peninsula is in Southwest Asia (also called West Asia; the more geographically accurate term for the Middle East) while the rest of Egypt is in North Africa. For geopolitical purposes, the Sinai is often considered part of Africa. Sinai is a land of contrasts. The desert interior comes to an abrupt end at the Red Sea, where coral reefs along the coastline are among the most beautiful in the world. The Red Sea has one of the highest amounts of marine life variety in all the tropical seas of the world. The contrasts continue in the religious realm as well, with the theory that the name Sinai is derived from the lunar deity Sin. The land of small groups of polytheistic worshipers of the trinity: Sin (Moon), Shamash (Sun) and Ishtar (Venus) gave way to the three monotheistic religions that would dominate the world. And the land that prophets, saints, and pilgrims traversed was also trampled by warriors like Alexander the Great, Ramses II, Napoleon Bonaparte, and Salah el-Din. The Arab-Israeli conflicts of this century in the area contrast with the thousands of tourists seeking spiritual solace in its remoteness. The geology of the Sinai Peninsula can be divided into three main areas. The northern part runs parallel with the Mediterranean coast and consists of dried up river beds, or wadis, leading to sand dunes and fossil beaches formed by the changing levels of the Mediterranean Sea during the glacial periods that some geologists claim occurred as far back as two million years ago. The landscape is flat and uniform, interrupted only by some vast sand and limestone hills in the region of Gebel Maghara. The central part of the peninsula is mostly comprised of the scarcely inhabited el-Tih Plateau, a high area of limestone formed during the Tertiary Period. The highlands extend towards the south until it goes over into the third area consisting of granite and volcanic rock. Limestone and sandstone sediments are replaced by granite and basalt escarpments that slope into the Red Sea and the Gulf of Aqaba. Both rocks are produced by volcanic activity on the bottom of the ocean from the Precambrian Age. Some geologists believe that some twenty million years ago, Sinai was connected with Egypt and the Saudi Arabian Peninsula as part of the same land formation. They theorize that thermal currents in the earth’s mantle created huge cracks, which lifted and spread the land. The eastern boundary of the peninsula is a geological fault zone known as the Great Rift Valley, which can be seen from the upper Jordan River valley, extending southward through the Red Sea into Africa. Although the general conditions of the Sinai Peninsula are dry and hot with sparse vegetation, it is not without life. Wildlife is specially adapted to the climate with many species of snakes and mammals camouflaged to the earthy tones of the desert. Some of the mammal species that exist are leopard, ibex and the Golden Spiney Mouse. There are several species of snakes and most are very poisonous: the Carpet Viper, Black Cobra, and Horned Viper are common. Lizards like the blue-headed Agama stand out against the neutral shades of desert sand and rocks. There is also an abundance of bird life particularly near the coastlines where many migratory species pass. The coral reefs along the Sinai coastline are rated among the best in the world for snorkeling and diving, and the Red Sea has an abundance and diversity of tropical marine wildlife. The Red Sea is named for the Red Sea Hills, a low range of mountains along the Red Sea Coast. Archaeological investigations of the prehistoric past have uncovered bones and flint tools that indicate the presence of human life in the desert as far back as 200,000 years ago. The earliest recognizable habitation of the Sinai was by the Monitu when it was called Mafkat or Country of Turquoise. During the first Dynasty of the Pharaohs the profitable trade of copper and turquoise mining had already begun. A bas-relief, discovered in Wadi Maghara, portraying Pharaoh Sekhemkhet (2600 B.C.E. ), indicates the earliest presence of Egyptian pharaohs in Sinai. The mines were operated on a seasonal basis, off and on, for thousands of years. Modern attempts to exploit the deposits have been unprofitable. The desert of the Sinai is particularly fascinating for those interested in some of the oldest civilizations chronicled in the Bible. The great patriarchs of biblical history, like Abraham and Moses, all lived in or passed through the area. The stories in Exodus of Moses leading the Hebrew people out of Egypt to wander 40 years in the desert, the manna falling from heaven and Moses receiving the Ten Commandments are the inspiration behind many a pilgrimage. Southern Sinai's Gebel Musa ("Mountain of Moses") is spiritually and historically significant for Christians, Jews, and Muslims. In the fourth century C.E., Coptic Christians came to the mountain and founded a small church at the spot where it was believed God spoke to Moses in the form of the burning bush. Later on, the site evolved into St. Catherine's Monastery, revered by many as one of the most sacred places on Earth. The monastery has survived many groups of desert marauders over the past 1,500 years. Muslims left it intact even during the Crusades because it honors one of Islam's most important prophets. Third century hermits sought refuge and seclusion in the heights of the mountains around the monastery. Currently Greek Orthodox monks occupy the monastery and protect its substantial collection of Byzantine art. There are many archaeological sites of interest in this desert. One site revealed nawamis, roofed rooms opening to the west that are thought to have been burial chambers from the early Bronze Age. The Nabateans who inhabited this desert in the second and third centuries left behind ornate carved rose-colored rock facades at the city of Petra. The Sinai Peninsula is also home to prehistoric structures called the “Desert Kites.” These odd configurations of stone walls built triangular with the tip leading downhill are believed to have been used to entrap gazelles. In 1844 the Codex Sinaiticus, one of the oldest Old and New Testament manuscripts in Greek, was found near St. Catherine's monastery. Until the early twentieth century, Sinai was under the control of the Ottoman Empire. In 1906 it became part of then British-controlled Egypt, when the Turkish government yielded to British pressure to hand over the peninsula. The border imposed by the British runs in an almost straight line from Rafah on the Mediterranean Sea to Taba on the Gulf of Aqaba. This line has served as the eastern border of Sinai ever since, and is now the international border between Israel and Egypt. In 1948 Egyptian forces passed through Sinai on their way to invade the newly-created state of Israel based on a United Nations mandate dividing the land between the Jews and the Christian and Muslim inhabitants. During the 1948 Arab-Israeli War, Israeli forces entered the northeastern corner of Sinai, but withdrew shortly after, following British and American pressure. Under the terms of the 1949 Armistice Agreement, Sinai, together with the Gaza Strip, remained under Egyptian control, although parts of it were demilitarized. In 1956, Egypt used its control of Sinai to impose a blockade on the Israeli port of Eilat. Following this, Israeli forces, aided by Britain and France (which sought to regain control over the Suez Canal) invaded Sinai, and in just a few days took control of the entire peninsula. Several months later, Israel withdrew its forces from Sinai, following strong American and Russian pressure. Following this, the United Nations Emergency Force (UNEF), was stationed in Sinai to prevent any military occupation of the Sinai. In 1967 Egypt reinforced its military presence in Sinai, renewed the blockade on Eilat, and on May 16 ordered the UNEF out of Sinai. In the following Six-Day War, the Egyptian army was defeated, and Israel took control of the entire peninsula. The Suez Canal, whose east bank was now controlled by Israel, was closed. In the 1973 Yom Kippur War, Egyptian forces built pontoon bridges to cross the Suez Canal and stormed the supposedly impregnable Barlev Line to gain control of most of the Eastern Bank. Some held positions and others were pushed back across the Suez Canal, the war ending with some of each side's forces on both sides of the canal. As part of the subsequent Sinai Disengagement Agreements, Israel withdrew from west of the canal and pulled out of an additional strip in the western Sinai—while Egyptians held positions in Sinai—allowing for the eventual reopening of the canal under Egyptian control. In 1979 Israel and Egypt signed a peace treaty, in which Israel agreed to transfer all control over Sinai to Egypt. Subsequently, Israel pulled out of Sinai in several stages, ending in 1982. The Israeli pull-out involved the destruction of several Israeli settlements including the town of Yamit in northeastern Sinai. The Sinai Peninsula is currently divided among several governorates, or provinces, of Egyptian administration. The southern portion of the Sinai is called Janub Sina' in Arabic, literally "Sinai South." South Sinai has its capital in At Tur. The northern portion is named Shamal Sina', or "Sinai North." North Sinai has its capital at Al Arish. The other three governorates converge on the Suez Canal, including Al Isma'iliyah on its southern end and crosses into Egypt-proper. In the center is As Suways, literally "the Suez," and Bur Sa'id lies in the north with its capital at Port Said. The Sinai is sparsely populated. Approximately 66,500 live in Janub Sina' and 314,000 live in Shamal Sina'. Port Said itself has a population of roughly 500,000. Portions of the populations of Al Isma'iliyah and As Suways live in Sinai, while the rest live on the western side of the Suez Canal in Egypt proper. The combined population of these two governorates is roughly 1.3 million. The economics of the region consist of tourism, limestone quarrying and oil drilling near the Gulf of Suez. Bedouins eek out a living through pastoral herding along the edges of the desert. All links retrieved September 21, 2015. This page was last modified on 21 September 2015, at 19:42.